The Autodromo Nazionale Monza is also known as The Temple of Speed. The F1 cars top speeds of 217 mph (350 kph) on the straights. And when it comes to speed, the Mercedes cars were comfortably faster than their rivals. Nico Rosberg was quickest of all, and a full second quicker than the Ferrari of Kimi Raikkonen who wound up third behind Lewis Hamilton's Mercedes. 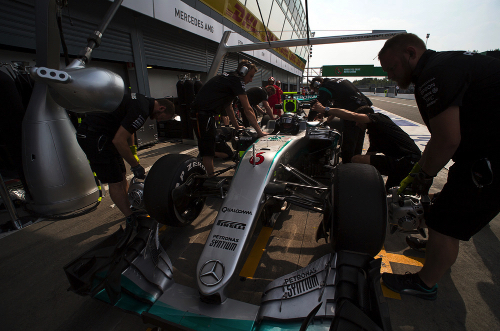 The line-up for the weekend was: Mercedes - Lewis Hamilton and Nico Rosberg. Ferrari - Sebastian Vettel and Kimi Raikkonen. Williams Mercedes - Felipe Massa and Valtteri Bottas. Red Bull TAG Heuer - Daniel Ricciardo and Max Verstappen. Force India Mercedes - Nico Hulkenberg and Sergio Perez. Renault - Kevin Magnussen and Jolyon Palmer. Toro Rosso Ferrari - Daniil Kvyat and Carlos Sainz. Sauber Ferrari - Marcus Ericsson and Felipe Nasr. McLaren Honda - Fernando Alonso and Jenson Button. Manor Mercedes - Pascal Wehrlein and Esteban Ocon. Haas Ferrari - Romain Grosjean and Esteban Gutierrez. Alfonso Celis replaced Hulkenberg in the Force India for FP1. Monza, of course, is in the heart of Ferrari country and in the hearts of the fans and drivers. "I enjoy the circuit," said Raikkonen. "Usually it's always a great weekend, even before I raced for Ferrari. I had some good memories and some not-so-good memories from here. It's never been straightforward weekends of races for me. But it's a great place to come and, for racing, it's quite a special place. "The circuit layout and obviously the history what is in the place, plus being part of Ferrari, we have amazing support and obviously our home race so hopefully this weekend goes well. We feel we have a good chance so hopefully we make all the right things and choose right when it comes and get the best out of it. But I enjoy coming here and race." Perez had the halo protection device fitted to his Force India, as did Button on the McLaren and Verstappen on the Red Bull as they did their installation laps around the 3.599-mile (5.793-km) 11-turn track. Button clocked a 1:28.922 with the halo, but Bottas, sans halo on the Williams, shaded that with a 1:28.527. Then Hamilton got serious and turned a lap in 1:25.124, and Rosberg beat that with a 1:24.946. Hamilton improved to a 1:24.123. He had set the fastest time in FP1 in 2015 with a 1:24.670. The drivers had Pirelli's medium, soft and super soft slicks for the weekend, plus some extra tires for FP1. "As was the case in Belgium, we have unmarked soft compound prototype tires, which are being used in today's sessions only," Pirelli tweeted. So Hamilton and Rosberg were first and second in the early going. The Ferrari and Red Bull drivers had yet to set times, but Mercedes was expected to remain one/two throughout the weekend. Rosberg drove the point home with a time of 1:23.736 and then a 1:23.651. Just before the 30-minute mark, the Ferrari guys climbed up the timing screens with Vettel posting a 1:24.642 and Raikkonen a 1:24.929. Hamilton then went even quicker as he posted a 1:23.643. At the 40 minute break, the top 10 were: Hamilton, Raikkonen, Vettel, Perez, Raikkonen, Verstappen, Bottas, Ricciardo, Alonso and Button. Things were quiet now, with just two or three drivers circulating in the lower ranks of the standings. Once more drivers got back out on the track, Rosberg got going and broke into the 1:22 range with a time of 1:22.959 using Pirelli's soft compound tires. Hamilton, also on the softs, got down to a 1:23.162. With just under 15 minutes remaining, Raikkonen moved up to fourth place, and then to third. Just about everybody was on track as the session wound down. The top 10 at the end of FP1 were: Rosberg, Hamilton, Raikkonen, Vettel, Perez, Grosjean, Bottas, Verstappen, Gutierrez and Ricciardo.